Through the gentle gift of guided meditation, internationally renowned visionary Sheila Applegate takes you on a journey of spiritual awakening. Her soothing voice opens you to connect with your own Spiritual Guidance to remember your oneness with all that is. Welcomed with the sweet singing spirit of Leah Shenandoah, your soul is lifted higher until you reach your own sacred place where your entire being is blessed by the decision to embrace this journey of love. Joanne Shenandoah uses the heartbeat of the drum to calm and strengthen your being, as her flute lifts and heals your spirit. This beautiful meditation unfolds with a depth of such profound spiritual truth. It will awaken both novice listeners and enlightened beings to new understanding on the path of remembrance. 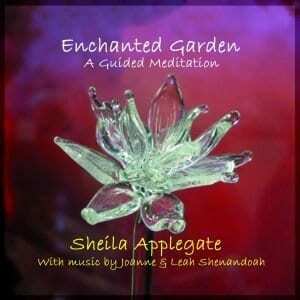 Sheila Applegate is an internationally renowned spiritual seer, healer and teacher. Sheila is an intuitive and clairvoyant who can de- scribe guides, people and situations in astonishing detail. She is able to see guides, angels and ascended masters; an ability that she has per- fected through years of experience….Sheila creates unique healing ex- periences grounded in unconditional love. She claims not to be the source of healing but rather the vessel through which the Creators Energy Flows. Leah Shenandoah brings the gift of her music and art to thou- sands of audiences around the world. As a widely traveled and sea- soned recording artist, Leah has been gifted with a sweet and pure voice which brings the listener to tears as she embraces the sound with her light and open energy. Leah opens her hands to the universe and allows light energy to flow through her song. Joanne Shenandoah is a Grammy award winning Oneida- Iroquios singer/songwriter, producer, composer, lecturer and actress. She has recorded 14 albums. Given the gift of music she has been per- forming and recording most of her life. She joins Sheila and Leah on this production as producer, keyboards, drummer and flutist. As a mu- sician, she has added to the tracks her own special gift of spiritual en- lightenment.